sulphide, we shall still obtain interference bands. 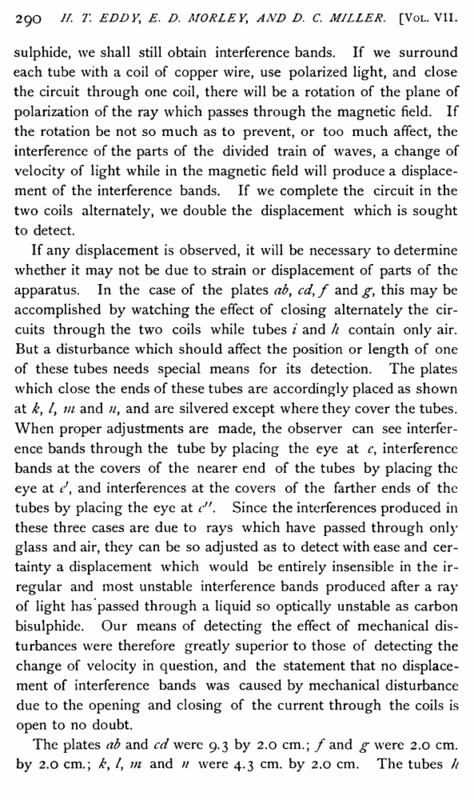 If we surround each tube with a coil of copper wire, use polarized light, and close the circuit through one coil, there will be a rotation of the plane of polarization of the ray which passes through the magnetic field. If the rotation be not so much as to prevent, or too much affect, the interference of the parts of the divided train of waves, a change of velocity of light while in the magnetic field will produce a displacement of the interference bands. If we complete the circuit in the two coils alternately, we double the displacement which is sought to detect. If any displacement is observed, it will be necessary to determine whether it may not be due to strain or displacement of parts of the apparatus. In the case of the plates ab, cd, f and g, this may be accomplished by watching the effect of closing alternately the circuits through the two coils while tubes i and h contain only air. But a disturbance which should affect the position or length of one of these tubes needs special means for its detection. The plates which close the ends of these tubes are accordingly placed as shown at k, /, m and 11, and are silvered except where they cover the tubes. When proper adjustments are made, the observer can see interference bands through the tube by placing the eye at c, interference bands at the covers of the nearer end of the tubes by placing the eye at c\ and interferences at the covers of the farther ends of the tubes by placing the eye at cn. Since the interferences produced in these three cases are due to rays which have passed through only glass and air, they can be so adjusted as to detect with ease and certainty a displacement which would be entirely insensible in the irregular and most unstable interference bands produced after a ray of light has passed through a liquid so optically unstable as carbon bisulphide. 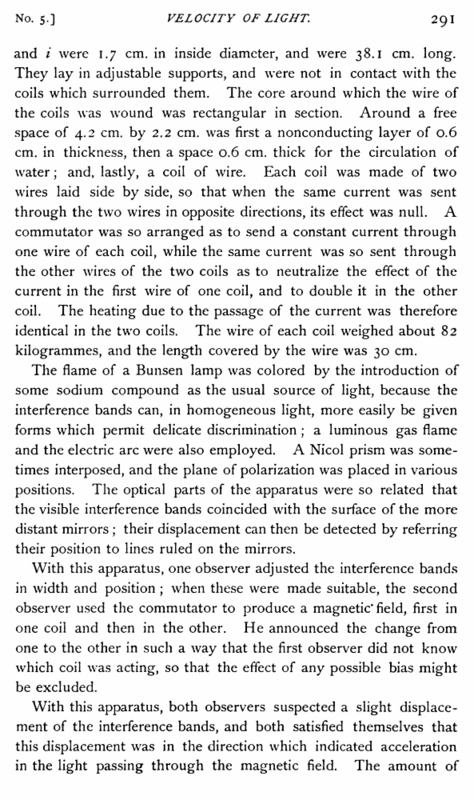 Our means of detecting the effect of mechanical disturbances were therefore greatly superior to those of detecting the change of velocity in question, and the statement that no displacement of interference bands was caused by mechanical disturbance due to the opening and closing of the current through the coils is open to no doubt.